DO YOU HAVE BEES IN YOUR HOUSE? The first step is to work out what kind of bees you have! Australia has 1,700 species of native bees. However, the most common type of bee found in houses is the introduced European Commercial Honeybee. Swarms of the introduced Commercial European Honeybee (Apis mellifera) sometimes escape from the white hive boxes used by beekeepers. 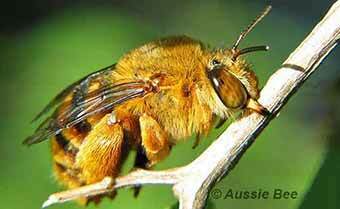 These bees may fly off and build feral nests in the bushland or in urban areas. The introduced Honeybee, Apis mellifera, is about 12 mm long and may be yellow-brown (such as the one below), or dark brown to black in colour (such as the one above), depending on the variety of the bee and its age. 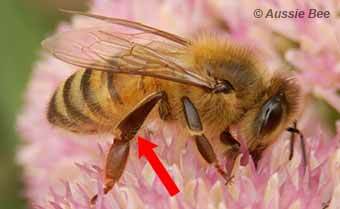 Above: introduced European Honeybees have broad plates on their hind legs (arrow) for carrying balls of pollen. These structures are called Pollen Baskets. 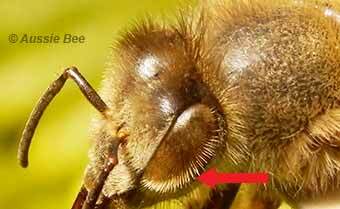 Above: introduced European Honey Bees also have hairy eyes but you will need a good hand lens to see this feature. 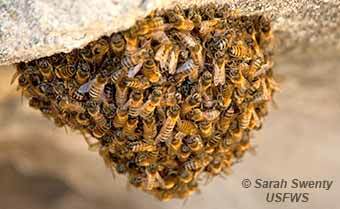 Above: you may find a swarm of European Honeybees clinging together in a large ball underneath a tree branch or other support. Photo: Sarah Swenty, USFWS. Some swarms of Commercial European Honey Bees build feral nests in exposed locations such as under a branch or the eaves of a house. Above left: this swarm of European Honeybees built an exposed feral nest under a tree branch. Above right: the large wax combs making up this nest can be seen after the bees were removed. Photographs kindly contributed by David Ritchie of Bellevue Hill. Other swarms of European Commercial Honeybees build nests in enclosed cavities, such as inside a wall, a chimney, a compost bin or a tree hollow. 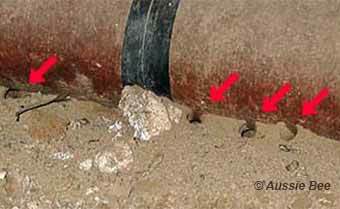 In this case you will see dozens of Honeybees flying in and out of a single entrance hole leading to the cavity. 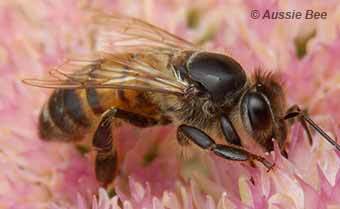 Feral European Honey Bees compete with native bees and native birds for food and nest sites. Feral Honeybees may also carry bee diseases that could threaten Australia's managed Honeybee hives kept for crop pollination and honey production. We recommend that you call a pest controller to have the nest removed. Look up the Yellow Pages telephone directory under 'Bee & Wasp Removals'. Don't forget that Honeybees can sting. It is best to stay away from them and seek professional assistance. Australia also has some native species of social bees (Tetragonula - previously called Trigona -- and Austroplebeia). 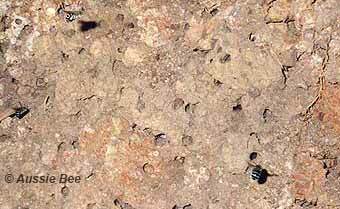 However, our Australian social native bees are black and only 4 mm long. These are our social native Stingless Bees. 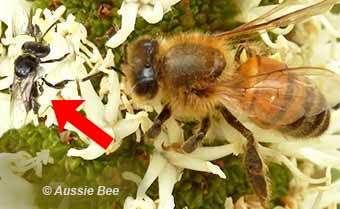 Above: the social native Stingless Bee (red arrow) is much smaller than the Commercial Honeybee (on the right). 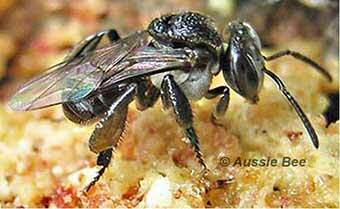 Above: a Tetragonula carbonaria social native Stingless Bee. More Stingless Bee photos. Our social native Stingless Bees are found in warm areas in Queensland, the Northern Territory, northern parts of Western Australia, and in northern and eastern parts of New South Wales. They sometimes build nests inside house walls or in cavities under footpaths. Above: two Stingless Bees peek out of their elaborate resinous entrance tunnel in North Queensland. Their nest is inside the wall cavity of the house. These bees are harmless and many home owners enjoy these miniature house guests. They make a great conversation piece and a safe natural history lesson for the children. Nests of these bees can be boxed. Our booklet, Boxing and Splitting Hives presents a complete do-it-yourself guide. 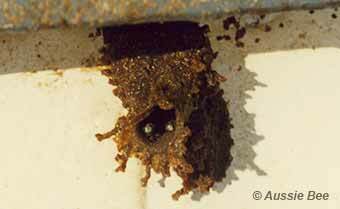 The Stingless Bees can sometimes also be coaxed to build a new nest in a box mounted in front of their nest entrance. Read our free Aussie Bee Online article: Natural Hive Duplication. There are hundreds of species of solitary native bees in Australia in a wide range of colours and sizes. Many nest in burrows in the ground. Others nest in pre-existing crevices or holes in timber. These beautiful native bees have red brown fur on their thorax and a black abdomen with blue to whitish stripes. They are about 11 mm long. 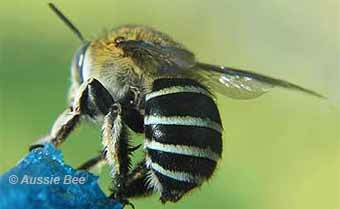 Blue Banded Bees nest in shallow burrows in the soil underneath houses, or in mudbricks or soft mortar. 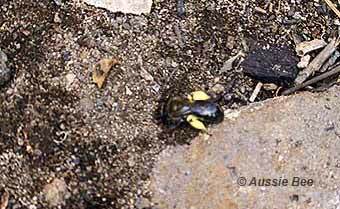 More information on Blue Banded Bees nesting in mudbricks or mortar. Above: three Blue Banded Bees search for their nest entances in this bank of clay soil underneath a house. There are many Blue Banded Bee nest burrows in this bank, some freshly dug but most disused. These fat native bees are covered with golden brown fur except for one or two dark stripes across their abdomen. They are about 12 mm long. More Teddy Bear Bee photos. Teddy Bear Bees may nest in shallow burrows in clay soils underneath houses. Above: a row of Teddy Bear Bee nest entrances in the soil, along the edge of an old roll of lino lying under a house. Although Teddy Bear Bees fly with a loud buzz and may fly around you as if they are curious, they are not aggressive and just want to get on with their nest building. They can sting but in our experience only do this if you grab one or step on it. Some other varieties of solitary native bees may build nests in deeper burrows in the ground in urban areas. Loose earth excavated from the burrow may surround the entrance hole in a small mound. Each nest burrow may be occupied by just one bee or in other species, a number of bees may share a burrow. Sometimes quite a few nest burrows may be found close together in the one area. Examples include: Leioproctus, Homalictus, Lasioglossum. Above: a Lasioglossum bee exits from her nest burrow. 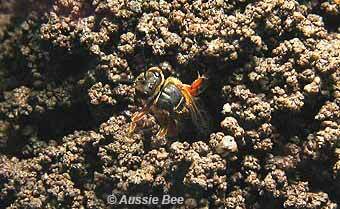 Other varieties of Australian native bees may build their nests inside pre-existing crevices or narrow cavities. 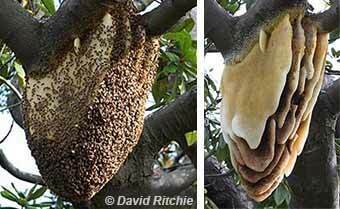 Resin Bees and Leafcutters are examples of bees that may do this. Resin Bees build tiny resinous cells for their eggs inside the cavity then seal the entrance with a resin plug. Leafcutter Bees cut regular circular or oval shaped pieces of leaf and use them to build tiny cradles for their eggs inside the cavity. 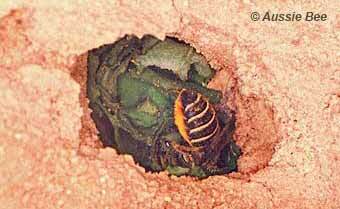 Above: a Leafcutter Bee putting the final leafy layers on her nest seal in a narrow hole in a mudbrick building. More Leafcutter Bee photos. Urban development has destroyed countless solitary native bee nests. Our Australian native bees are a precious resource for the future pollination of our bushland and crops. Adult solitary bees generally only fly for a few months in the warm weather and solitary bees can be great garden pollinators. 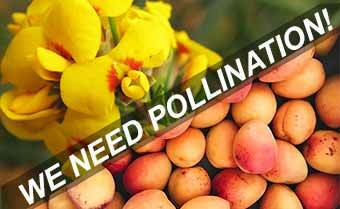 If at all possible, please protect your solitary native bee nests. Find out which native bees live in your area. To learn more about our solitary native bees, read our native bee field guide. The Australian Native Bee Research Centre accepts no liability for any loss or damage arising from the use of the information on this webpage.